Salisbury's bus station has closed for good after 75 years. Salisbury Reds said only a third of its routes now began at the Endless Street site which did not justify its continued operation in the face of increased maintenance costs. The current hub will be replaced by various stops around the city centre. One stop is outside the Red Lion Hotel in Milford Street, but its manager said it was not suitable and was causing a bottleneck on the road. The station opened in 1939 as the headquarters for Wilts and Dorset buses. Andrew Sherrington, from Salisbury Reds, said the site had become "very tired". "They're very old buildings, increasingly taking up a lot of time, effort and money to maintain," he said. "The building is full of asbestos, the drains keep collapsing. "Instead of spending money on the site I would very much like to keep spending money on investing in new vehicles." 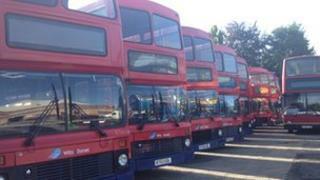 He added: "A very small percentage of my bus services leave from the bus station. "It was built for Wilts and Dorset headquarters, a much larger company that spread as far as Basingstoke. We just don't need the space at all." But Mark Pramley, manager of the Red Lion, said: "The bus station is a central focus for the city, everyone knows where it is, everyone knows where they're arriving. "It seems we've now got bus stops scattered in five different areas around the town. "The one outside our hotel is just causing a bottleneck on the street. "The infrastructure around the Guildhall is good and that would probably work well if that was the focal point. "Our street is just not wide enough or long enough to have that number of buses." The travel shop will remain at the original site until the company is ready to move into a new building.